Even though your baby’s teeth will fall out and be replaced by shiny, new adult teeth, it is still important to take care of your baby’s first teeth and to guard against baby bottle tooth decay. Why? Because baby teeth are critical to ensuring evenly-spaced adult teeth. Baby teeth serve as place holders for the eventual appearance of permanent teeth. If a baby tooth succumbs to decay and falls out before its time, permanent teeth can shift to fill the empty space. This can make it hard for additional permanent teeth to grow in the right space. Tooth decay can start as soon as your baby’s first teeth come in. Baby teeth are just as susceptible to bacteria as adult teeth. 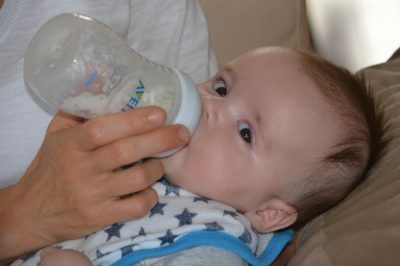 In fact, babies can pick up bacteria from just about anything, including their own parents’ mouths. It’s best not to share spoons or cups with your baby. And, make sure you clean pacifiers with water and not by licking them. The likelihood of tooth decay increases when a baby’s teeth are subject to sugary liquids for long periods of time. Liquids such as flavored or sweetened water, fruit juices (even watered down), formula, and breast milk can wreak havoc on your child’s teeth. In order to avoid baby bottle tooth decay, don’t use a bottle as a pacifier and don’t send your child to bed with a sippy cup. In addition to monitoring exposure to sweet liquids, get into the habit of brushing your baby’s teeth. Use a tiny amount of fluoride toothpaste on a child-size toothbrush to brush your baby’s teeth twice a day. You should schedule your baby’s first dentist appointment by the time he turns one. Baby bottle tooth decay can create problems for your child in the future, so don’t take this matter lightly. Start developing good dental hygiene practices today.